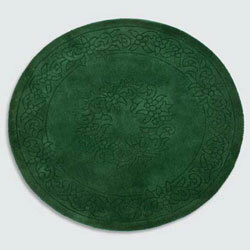 Plain Royale round rugs have a soft chunky pile which has an embossed floral design hand carved into the pile. This range is handmade in India, the pile is made from pure wool. Royale rugs are available in circles, oblongs and half-moons. This range can be custom made to your required size.